PROUD father Dean Duursma described son Xavier’s AFL debut as “awesome”. 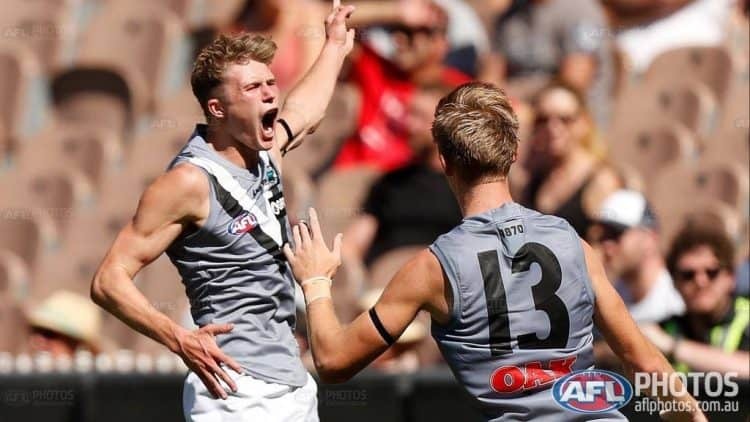 The 18-year-old was among three debutants in Port Adelaide’s 26-point win over Melbourne at the MCG on Saturday. With 13.5kms covered, 16 disposals and a slick goal, Xavier has been praised by the football world for a great start to his career. About 100 locals were at the game to cheer him on and the Foster prodigy was all smiles at the final siren – rushing to the boundary to celebrate with friends and family. The Foster Football Club snapped up 40 tickets, while a friend of Xavier’s purchased another 30. The Duursma family was given another 20 by Port Adelaide. It meant a good part of the ‘G was strictly Duursma. Dean said Xavier had been “blown away” by the local support. “There were people there from Foster, but also from Fish Creek, Inverloch – all over. Mates he played footy with at Gippsland Power came along and even some players from other TAC clubs, who’d played against him,” Dean said. A big part of the day was the build-up, with Dean given the opportunity to present Xavier his jumper in the rooms before the game. “The whole family was in the room. The debutants – Xavier, Connor Rozee and Zac Butters – have all bonded well. I think they’re really at the core of what Port Adelaide is trying to achieve over the next 10 to 15 years. All those boys earned their spots. No one was gifted a game,” Dean said. After the game many of Xavier’s supporters, including parents Dean and Suzie and the rest of the Duursma clan, went out for dinner to celebrate the win.